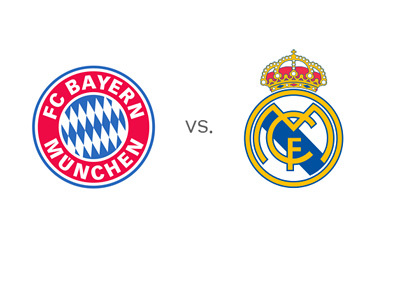 Over the weekend, both Bayern and Real fired warning shots ahead of the UEFA Champions League semi-final encounter at the Allianz Arena on Tuesday, April 29th, 2014. Bayern won 5-2, while Madrid won 4-0, both playing against lower table opposition. The Tuesday's battle in Munich has the potential of being epic. The score from the first leg match is 1-0 for Madrid. Bayern had the possession in the first leg match, but Real Madrid had all the chances. It could have been 3-0 for the Spanish side. Pep Guardiola was criticized in the German press for his choice of formation after the game, while Carlo's Ancelotti's tactics were praised in the Spanish capital. According to the odds, Bayern are the favourites to win in front of their own fans, while Real Madrid are the favourites to advance to the final. Both teams are promising to play attacking football on Tuesday. If Real Madrid score one, Bayern will have to score three to advance. The match on Tuesday could be one for the books. Ronaldo is in top form again for Real, check out his second goal vs. Osasuna on the weekend. In their last ten encounters in Germany, Bayern have won nine against Real Madrid and drawn one.